Lights of Christmas | Your Christmas Lighting Decor! Lights of Christmas has been providing commercial grade lighting products and services to residential and commercial properties for a tailored, professionally decorated exterior since 1992! Our company strives to bring back the child-like excitement of the Christmas season. We bring your home and business to life with professional quality design, lighting, and holiday decor! Look No Further For Your Christmas Decorating Designs, Lights and Decor. Lights of Christmas prides itself in providing each and every customer with a professionally decorated exterior through our design services, commercial-grade products and professional crews that install, maintain, remove, pack and store the Decor in our warehouse until the following season. The total package we provide, relieves you of any additional stress during the season knowing that your property will be beautifully decorated without your ever having to come up with a design, shop for the products or take your time to install and maintain the products throughout the holidays. Lights of Christmas provides you with a completed design installed and ready for you, your family, friends and neighbors to enjoy! We Decorate Commercial Properties, Residential Properties and other Exterior Structures. Not only do we decorate commercial and residential properties, we can also decorate other exterior structures such as bridges, gazebos, playhouses, garages, sub-division entrances and landscaping. If you can see it, we can decorate it with few exceptions. We custom decorate your home and business to include, but not limited to, roof-lines, windows, columns, and your landscape with commercial-grade wreaths, garlands, trees, bows, lights, and custom requests as well. Currently, Lights of Christmas serves the entire Birmingham, Alabama area and surrounding areas within a 100 mile radius. Areas outside of this radius are considered on a job-by-job basis. Go to the Appointments or Estimate Form page to get started on your project now; it is never too early to begin working on your Christmas exterior design. The later it gets into the year, time and weather impact our being able to meet with you, however we can still provide you with a design package and estimate for your review and consideration. 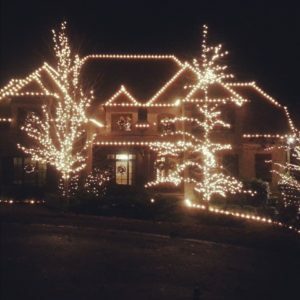 We moved into this house in the summer of 2007 and the first holiday season we discovered Lights of Christmas. I had to have it—this is my Christmas present to me and my family. Friends not only love the way our home looks during the Christmas season, but everyone looks forward to the lights. It has become a family seasonal tradition. A big thanks to Jo Marie and Kim for helping to bring joy and happiness to so many. See our drone video on Facebook.